How readers access Trak.in through Mobile Devices! I had to share these stats about trak.in for quite some time now, especially because we feature so many external Mobile usage related reports showing popular mobile devices and their OSes – however, one thing I have found with those reports is that most of them are skewed towards western markets. Trak.in gets about 80% of its web traffic from India – and so is the case with mobile traffic as well – It will give a fair idea which mobile devices, mobile Operating System are popular with trak.in readers specifically and Indians in general. 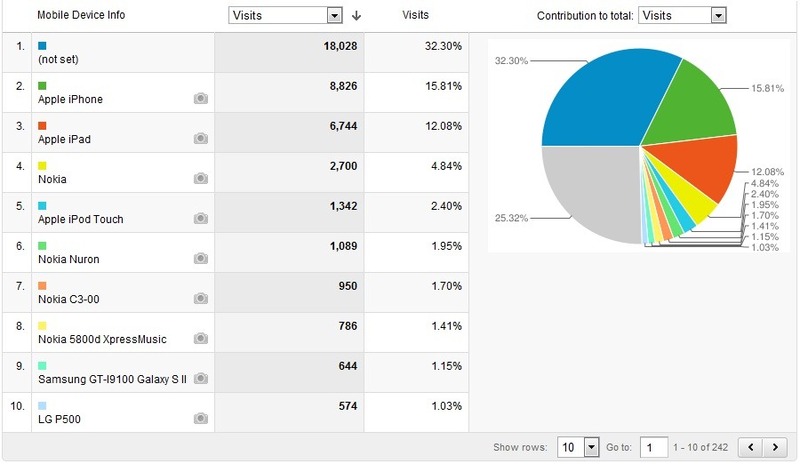 I have taken a sample size of 55,819 unique visitors who accessed trak.in in last 2 months on their mobile devices [These are not page-views, but unique visitors]. 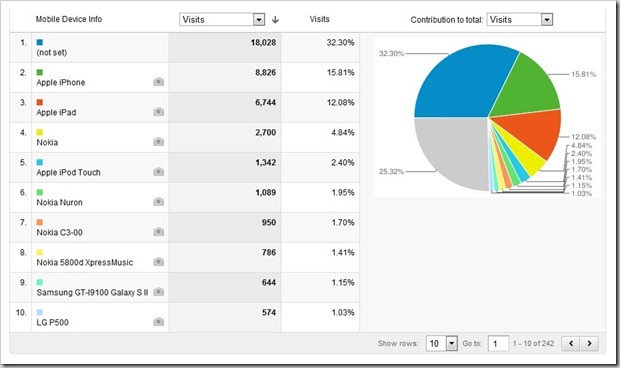 The reports are all generated using Google Analytics. The report is very much consistent with the trends we have been seeing – Android devices are getting popular with consumers with close to 30% of all Mobile visitors visit trak.in on Android devices. Nokia’s own operating system has 19% share followed by SymbianOS at 16.5%. I remember that in late 2009 and until mid of 2010, Nokia was leading all the way with close to 40% share, which has deteriorated a lot over last 12 to 18 months. We have a problem here – Google Analytics shows that 32.3% if all phones don’t have the brand set on the phone (or GA cannot read it), but I’d have to assume that majority of them are Android phones, which is obvious from the previous chart that you see. Even then, 30% of all the mobile visits are on Apple devices – honestly, I did not expect this as penetration of Apple devices is quite low in India. However, it may be possible that high percentage of our US / UK visitors would be accessing it on Apple devices. Again Nokia has taken a major hit over last few months, with only 1 in 5 devices being Nokia branded. The same figure couple of years back was 3 in 5 devices! Android, being open creates lots of issues – Even in this report, we have cant get names of 32% of devices and I guess most of them are Android. Having said that Apple iPhone and iPad are the most popular devices on which trak.in visitors access it. 56% of all visitors that access trak.in on mobile, access it on touch-screen devices – If you compare this figure with 2009, it was less than 10% back then. Its simple, Android is fast gaining popularity, especially among Indian mobile users. The growth is fuelled by the fact that you can now pick-up android based phones for as little as Rs. 3000/- ($60). New low end Tablets now cost as low as Rs.7000 ($140). And with that kind of price range, if a mobile user can get their hands on an Android device – Nothing can stop Android from reaching the masses. Currently Trak.in gets about 7-8% of its overall traffic from mobile devices – Looking at the past growth, I can confidently say that traffic from mobile device to trak.in will atleast double in next 12 months! If you have any questions on this report – I would be glad to answer them!